​Thank you for your enquiry about the Hurstbridge Food Cooperative. This CoOp is open to anyone who can pickup from the Hurstbridge area, or can organise a group pickup. Currently there is a group pickup point in Briar Hill. Following is some information about our CoOp, some pricing comparisons, how it works and what your involvement would be should you wish to join. 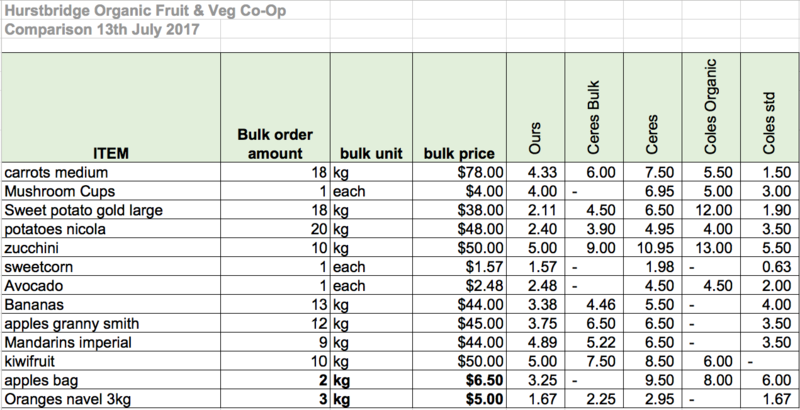 Here is a simple comparison that was put together on one of our orders to show the difference in pricing to Ceres Bulk buys, Ceres standard pricing, Coles organic items and Coles standard. Being part of our CoOp is such a beautifully attractive option to good, direct, cheap, organic produce. As with most Co-operatives, everyone is expected to participate on some sort of level. We have various administrative roles, such as coordinator, finance, roster, order compiler, etc. as well as hosts and packer roles. There are a few roles available at the moment for packers. This role is usually done in two's, kids welcome and you may be rostered on once every 4-6 weeks. It involves 2-3hrs of breaking up the wholesale quantities into each individual order (Thursday between 11am-2pm). Currently orders are happening fortnightly until our member numbers pick up. $10 subsequent annual fee - covers sale repairs, tape, stationary etc. Thur-Sun - Order form created on a 'Google Sheet' and shared out to the CoOp for order update. - 11am Packers divide up each bulk veg/fruit according to the packing sheets (about 2 hrs). All the host venues are child friendly. ​- Payment to be made by the following Monday. You will be given a roster with host and packer details. For the first few times, new packers will be teamed with experienced packers to learn the role. Rosters are put together 2-3 times per year. Selection changes each week as we order seasonal and available produce. It is only a selection of things, so most people still need to get some things from the shops. (Sample order). There is almost always potatoes, carrots, onions, bananas, apples, salad vegies etc. As you will see on the order form we order in one tenths (0.1, 0.2 etc) and single order item (1,2 etc in the last section of the form). We have found this is the best way to keep our quantities large enough to get most items each week. There is assurance available when first ordering. We encourage everyone to order each week so we are able to buy the bulk quantities. We only order an item if we have 70% of the quantity. Some weeks you may get more than you ordered or sometimes less. We tend to all be a bit flexible about this. Also if our driver sees a special or we don’t receive a particular ordered item, he may pick something else up from the market. If you don’t want anything extra we do have a list of members who never receive anything except what they have ordered. At times, and by agreement with the members, we also put together a compassionate box for a struggling family of roughly $40. This adds $2 to each of our bills. These amounts are very dependant on the numbers in the co-op – when we have a full quota of members the delivery fees are go down as there are more members to share the cost. If you have any issues with your box, for example not receiving something you know was ordered or receiving something you did not order please email the whole group. Members then respond and you can either organize to collect/drop off extra’s or keep them and pay yourself. We encourage a response whether or not you received the goods just so everyone is kept in the loop. If you are charged for something you did not receive and nobody else has it, we have a rule that if it is under $5 you cover the cost, if it is over $5 you let the treasurer know and deduct it from your payment. All payments are transferred via direct deposit. This includes float deposit, annual fee and order payments. Payments for orders are to be submitted after receipt of bill and before the next order. It is a lot of information to take in and it may sound confusing, but once you get the hang of it, it’s really simple. I am available to help you with your first few orders, and any questions you might have.